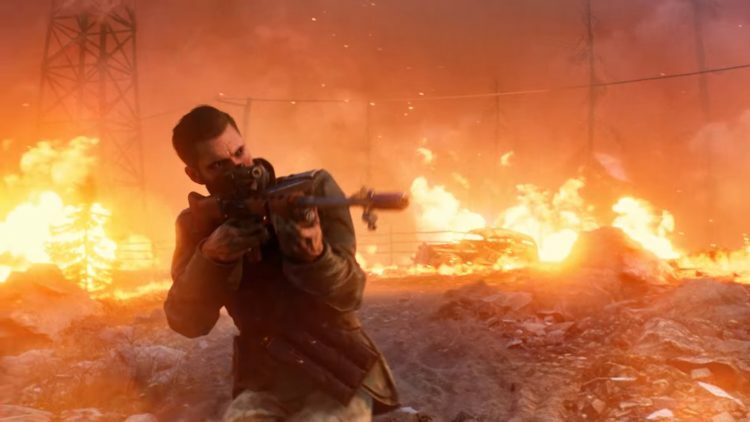 As part of Battlefield V Firestorm’s blend of battle royale and classic Battlefield gameplay, you’ll inevitably hop into and come up against tanks when trying to be the last man, or team, standing. Being inside one can be a big boost to your chances of success, but having to try and take one down can be a pain. Here’s how to counter and destroy tanks in Firestorm. The tank has a couple of weaknesses that every Firestorm player should be aware of. The first is its literal, physical weak point, on the back of them. It’s just like what you’ve no doubt seen in Battlefield and other FPS campaigns and multiplayer modes before. However, to make tanks feel a bit more balanced in Firestorm, they also have a slight weakness when it comes to mobility, or its lack of duration. Tanks require fuel, so can’t be driven forever around the map. Though they can be refueled by finding Jerry Cans around Halvoy and using them on the tank, it’s still something worth keeping in mind whether you’re driving the tank, so you know when to hop out and look to refuel, or if you’re up against one. Finally, it’s worth noting that any persons inside a tank when it’s destroyed cannot be revived. I mean, it’s a big explosion, so it does make sense. It’s important to keep in mind these weaknesses when taking on a tank in Battlefiled V Firestorm. With regards to their weak point on the back, use a Panzerfaust on it. This will deal a good bit of damage to the vehicle, so three or so of these should be enough to finish it off. Alternatively, you can find anti-tank weapons placed around Firestorm’s map, such as the Pak 40. Just like the Panzerfaust, focus fire on the rear of the tank. If you clock the location of one of these during a game, it might be worth trying to lure a pursuing tank unknowingly towards one. The tank’s limited fuel reserves mean that it’s not some unstoppable force that’s going to last the entirety of a game. Be smart about whether you really even need to take on the tank. If you’re looking for the win, it might be best to take cover and plan a getaway when you can slip by unnoticed. That gives you a chance that it’ll be out of fuel by the time you next meet them, if they don’t happen to find a Jerry Can. This is particularly noteworthy if you don’t have any anti-tank weapons.